This seat map is for the Airbus A350-900 as flown by Finnair. The AY 350 is new, comfortable, and modern. The AY350 (38J 28PE 214Y) is used on UK and Asian routes. The Finnair Airbus A350-900 seat plan has two classes in one of the most technologically advanced jetliners flying, with larger than normal windows providing panoramic views, and large luggage bins. 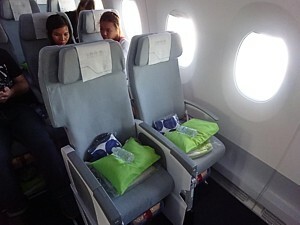 Business Class is divided into a main and a much smaller mini cabin. All have flat beds, but there is more noise in the larger front cabin. 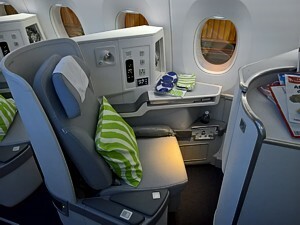 The Finnair A350 seating plan has a good modern Economy Class, with decent modern seats, and a large HD seatback TV. Finnair does not have Premium Economy, but instead offers Economy Comfort with four extra inches of legroom and more amenities for an extra €50. ►Hover mouse pointer over a seat for Finnair Airlines A350 seat pictures, and a description of that seat. Finnair have an OK reputation for inflight food, with a complementary bar on Asia flights (Free beer & wine). Seatback TVs in all classes on Finnair A350, with AVOD (on demand) showing 100 films, and wifi access (free in Business). 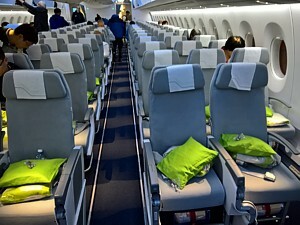 Finnair A350 Seat reservation before the flight is free in First and Business. Finnair Airlines have Online Checkin from 48 hours before the flight, when all seats may be booked for free. Finnair Airlines have lounges at Helsinki which are open to Business Class passengers. At other locations, out-station lounges are used. Best economy seats on Finnair Airbus A350-900: A Finnair Airbus A350 economy class review shows the best seats are normally regarded as 42A & 42K, however they are blighted by lightspill from the bathrooms, and the door slide infront. Many couples prefer the seats 21A and 21K, which have plenty of room - but not such a great view out of the window. Total in fleet: 19. There will be nineteen Airbus A350-900 in Finnair fleet eventually in this 46J43P208Y layout, called the AY 35G. This Finnair A350-900 seat plan applies to registrations OH-LWA, OH-LWB, OH-LWC, OH-LWD, OH-LWE, OH-LWF, etc. Finnair A350 Business Class is a delight, and while conventional offers high wings, a flat 75 inch bed (26 inch wide) with plenty of lockers to store shoes and headphones. Finnair A350 Finnair Economy Comfort just gives you a little bit more legroom over economy, but few other perks. Finnair A350 Economy Class reviews tend to praise the service of the cabin crew, rather than the seat, which is pretty conventional. There is a rather good 10.4 inch seatback TV, and USB power sockets.